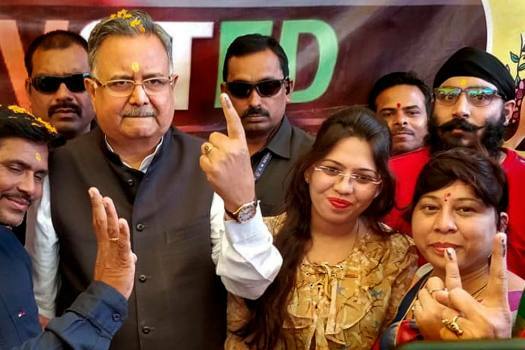 Chhattisgarh Chief Minister Raman Singh shows his finger marked with indelible ink mark after casting his vote during the ongoing State Assembly elections, in Kawardha. 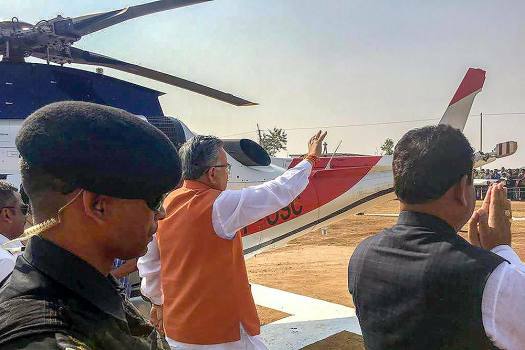 Chhattisgarh Chief Minister Raman Singh greets his supporters during a campaign trail for the Chhatisgarh Assembly elections, in Raipur. 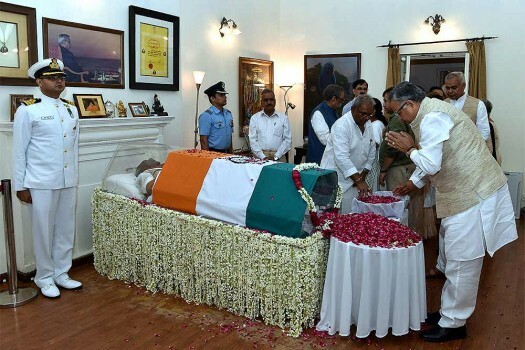 Chhattisgarh Chief Minister Raman Singh pays tribute to former prime minister Atal Bihari Vajpayee, at his Krishna Menon Marg residence, in New Delhi. 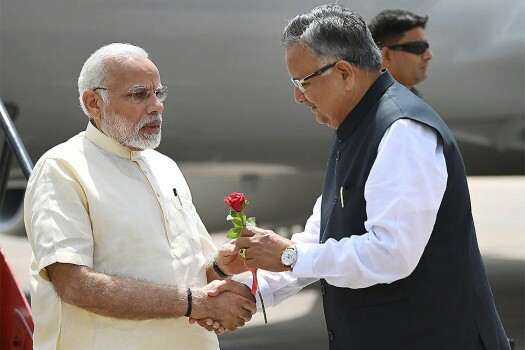 Prime Minister Narendra Modi being received by the Chief Minister of Chhattisgarh Raman Singh, on his arrival at Naya Raipur, Chhattisgarh. 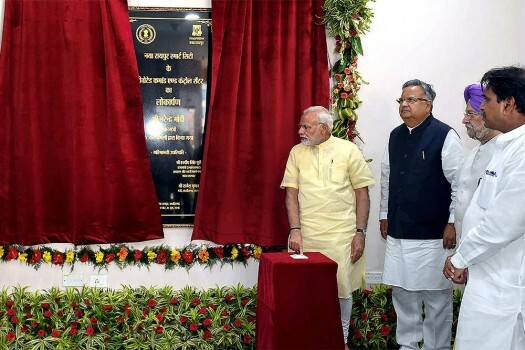 Prime Minister Narendra Modi inaugurates an Integrated Command & Control Centre, in Naya Raipur, Chhattisgarh. 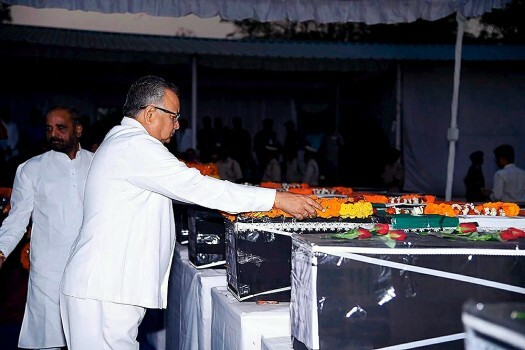 Chhattisgarh Chief Minister Raman Singh is also seen. 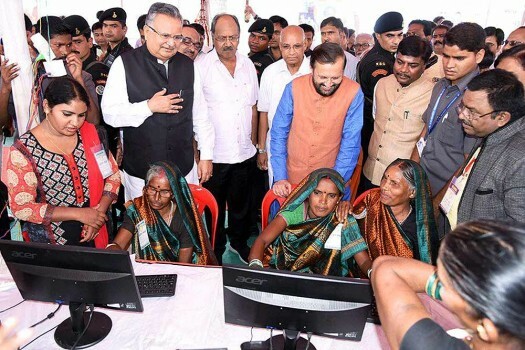 Union Minister for Human Resource Development, Prakash Javadekar and the Chief Minister of Chhattisgarh, Raman Singh at the ‘Mukhyamantri Akshar Samman Samaroh’ in Raipur. 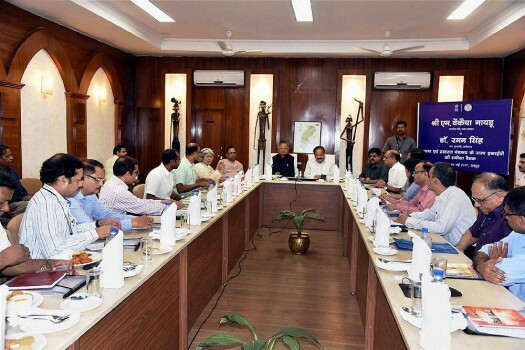 Union Information and Broadcasting Minister Venkaiah Naidu chairing a review meeting of media units of I&B along with Chattisgarh Chief Minister Raman Singh, in Raipur. 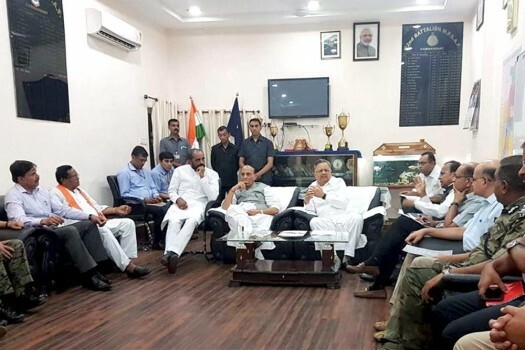 Union Home Minister Rajnath Singh and Chattisgarh Chief Minister Raman Singh hold a meeting on the Sukma Naxal Attack, in Raipur. Singh said the West Bengal government has violated all democratic norms by misusing powers and is 'running a syndicate' in the state. 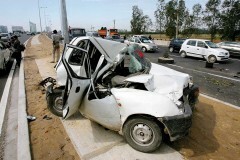 Two IAS officers with state Food Civil Supplies department were also booked in connection with this case. 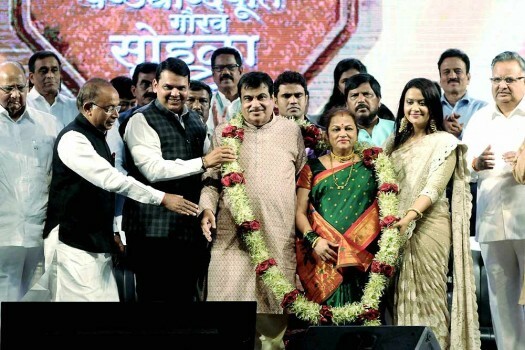 The election results showed that farmers, as also tribals and other voters of his state, did not want even 'Lotus' of the saffron party and decided to support the 'Hand' of the Congress. 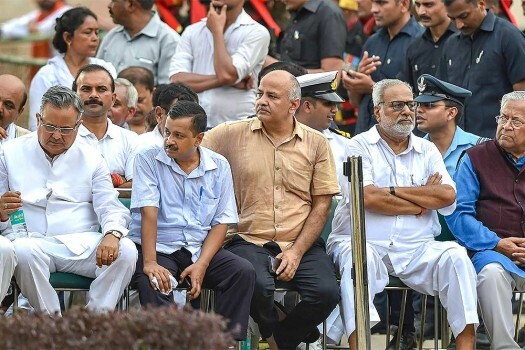 Gandhi, addressing a press conference in Delhi after the assembly election results, also said that "PM Modi is unable to take the pressure coming from the Opposition." 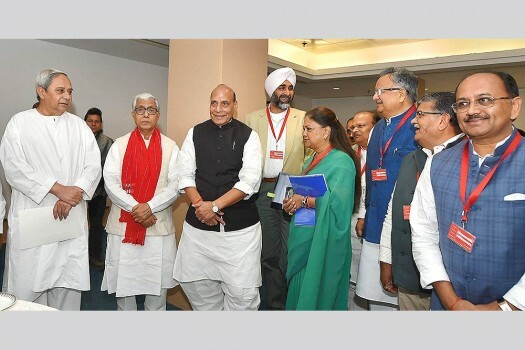 Opposition leaders have been talking about a strong anti-incumbency wave against Singh, who has been a Chief Minister for three consecutive terms. 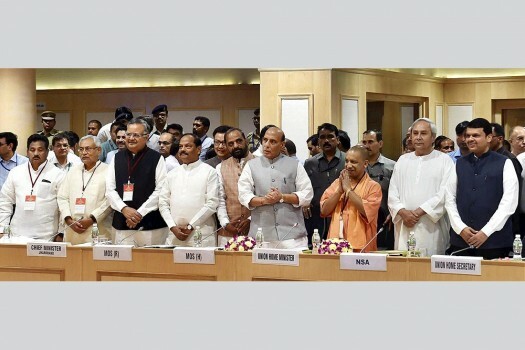 Chhattisgarh has 90-member Assembly and the polls are being held in two phases i.e. on November 12 and 20. The votes will be counted on December 11. Candidates contesting in 90 assembly constituencies in the upcoming election will be announced on October 19 and 20. 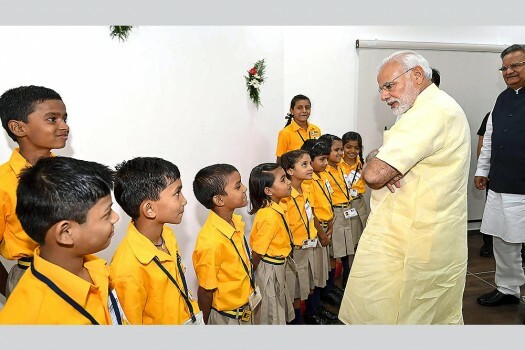 Besides the capital, several other government institutions and projects will be named after Vajpayee, who died last week. "Had I been B team I would not be contesting election from Rajnandgaon (the chief minister's constituency). Had I been B team I would have not faced a baseless case of murder." The Chhattisgarh police is using an audio music album - comprising songs in regional languages - as its latest weapon to encourage Naxals in the Bastar division to shun violence. 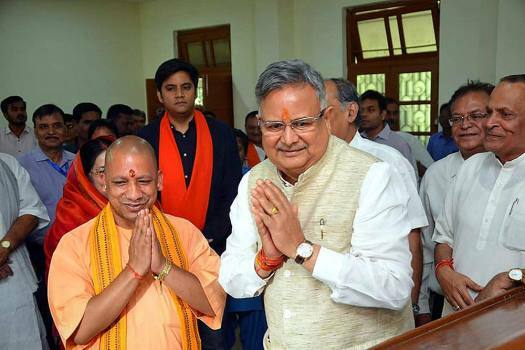 Mood In Chhattisgarh Favours Anti-Incumbency, But Will Congress Benefit From It? 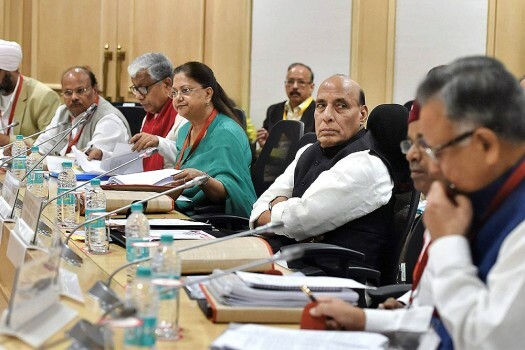 In the 2013 state assembly polls, the Congress had secured 40.3 per cent of the vote share and 39 seats, which was not far from the BJP’s 41.18 per cent and 49 seats. 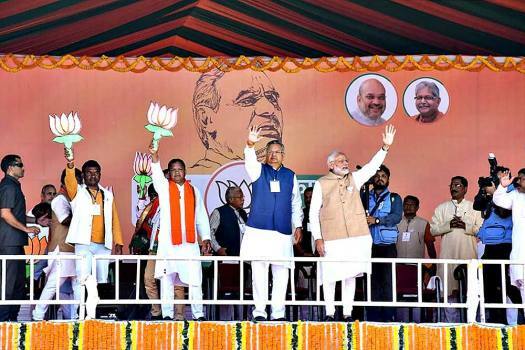 The Chhattisgarh CM is confident of a hat-trick of victories for the BJP and a defeat for the Congress. A tracker can locate a looted weapon wherever it is taken or used while biometrics can make a smart gun useless for anyone else except the authorised user. 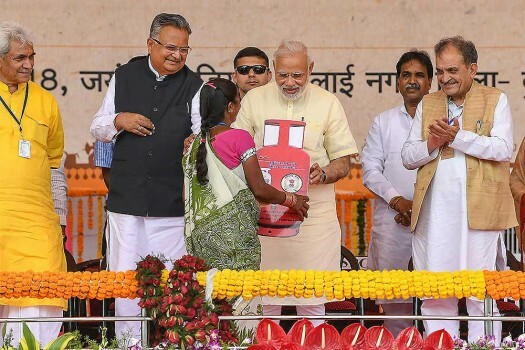 The ambush took place in the Kalapathar area of south Bastar region, one of the worst-hit by Left-wing extremism in the country.